Former student activist makes inflammatory anti-Israel remarks on Facebook; Canadian pro-Israel group complains to the police. The Israel advocacy organization Calgary United With Israel (CUWI) submitted a complaint to the Calgary Police last week, over horrific remarks made against Israel by a pro-Palestinian student activist, according to Shalom Toronto. Ala'a Hamdan, former president of Solidarity for Palestinian Human Rights (SPHR) at University of Calgary, made a number of inflammatory remarks on her Facebook page. Regarding rock attacks on Israelis, she stated, "this is my weapon with which I will release my people [. . .] children of Palestine are called the children of the stones, because our souls, resistance, blood and life are connected to the stones." The reference, presumably, is to the ancient stones of Jerusalem, which the Palestinian Arabs have been claiming for decades never had a link to their inherent Jewish origins. "I'm glad, because I'm proud to be a Palestinian, I am proud to be arrested while fighting to liberate my country, my people," she wrote elsewhere. "I smile, because I sacrifice my life for my land." According to the National Post, the University of Calgary Students’ Union supports the pro-Palestinian group; it even won an award for "best advocacy club" last year. CUWI founder Ryan Bellerose maintained that the posts constitute hate speech, and defended the move to approach the police with the complaint. Current SPHR president Wesam Cooley denied the reports, claiming "CUWI has been smearing us for months" and that the accusations are "false and baseless." Anti-Semitism has been escalating in Canada, despite the fact that current Prime Minister Stephen Harper and other government officials are supporters of Israel. The government itself appears to be cracking down on anti-Semitism under the guise of anti-Israel activity, however. Just last week, the Ottawa Federal Court made a major legal decision to deny funding to a pro-Palestinian group involved in anti-Semitic activity. 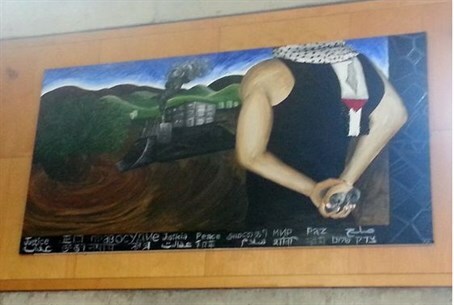 However, some universities and public figures have jumped on the anti-Israel bandwagon. Last week, a Canadian Broadcasting Corporation (CBC) anchor raised ire from the Jewish community when he suggested that a Jews should not be appointed as the Canadian Ambassador to Israel due to "bias." "Vivian Bercovici is Jewish, so there are going to be some questions," CBC anchor Evan Solomon stated on live television Thursday, during an interview with Foreign Minister John Baird. "Why not appoint someone who doesn’t even have the perception of any kind of bias (in favor of Israel)?"